The landscape of Rosebery is being redeveloped as high-density housing, displacing many industrial businesses. Whether you’re a long-time resident or a new developer with a vision of the future, when you need an electrician in Rosebery we hope you choose Randwick Electrical Services. 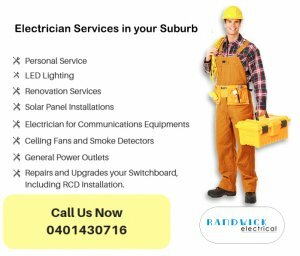 Randwick Electrical Services is not only your go-to electrician in Rosebery. We can offer advice and provide installation and maintenance on a range of alarm systems, security systems, door entry systems, and CCTV systems. Want to make your home more energy efficient? Whether you’re a long-time Rosebery resident or a new developer, energy efficiency should be a priority to make your projects more affordable. We are a friendly team of electricians who understand that you want a reliable and cost-efficient solution. Look no further than Randwick Electrical Services when choosing an electrician for your home. For a no-obligation quote, or to simply ask us a question about your electrical requirements. We want every family and business to meet their energy efficient goals and inspire the next generation to take care of our beloved country. To feel the difference of working with electricians that are truly local, call Randwick Electrical for repairs, new projects and consultations. Because we understand where the Rosebery came from, and what the future may hold. That’s one of the reasons why Randwick Electrical continues to get high ratings on True Local.